Former FBI deputy director Andrew McCabe has been fired two days before his scheduled retirement. US attorney general Jeff Sessions sacked Mr McCabe on the recommendation of FBI disciplinary officials. It comes ahead of an inspector general report which is expected to conclude that Mr McCabe was not forthcoming with the watchdog office as it reviewed the bureau's handling of the Hillary Clinton email investigation. "Based on the report of the Inspector General, the findings of the FBI Office of Professional Responsibility, and the recommendation of the Department's senior career official, I have terminated the employment of Andrew McCabe effective immediately," Mr Sessions said in a statement. 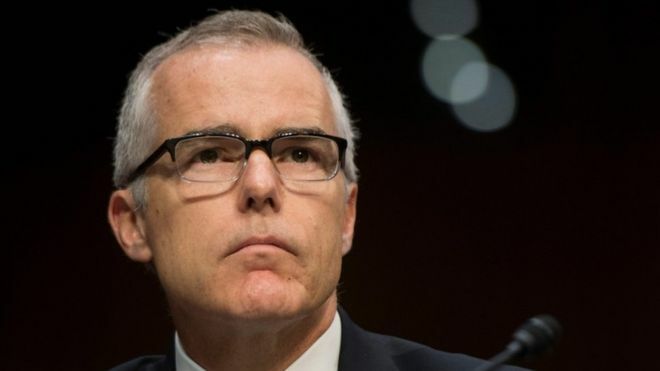 He said investigators "concluded that Mr McCabe had made an unauthorised disclosure to the news media and lacked candour - including under oath - on multiple occasions."